Continuing the grand adventures of Castle Ravenloft, The Legend of Drizzt, Wrath of Ashardalon, Temple of Elemental Evil, and Tomb of Annihilation! Following in the path of the other critically acclaimed D&D board games, the brand new 2018 Adventure System Board Game will feature multiple scenarios, challenging quests, and a plethora of adventures forming an incredible campaign. Brought to you by WizKids, with game design by Kevin Wilson, the 2018 Dungeons & Dragons Adventure System Board Game will include cooperative game play designed for 1-5 players. 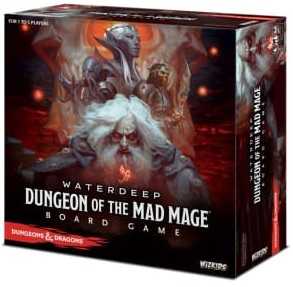 The contents can also be combined with the other D&D Adventure System Cooperative Play board games to create an even more exciting experience.